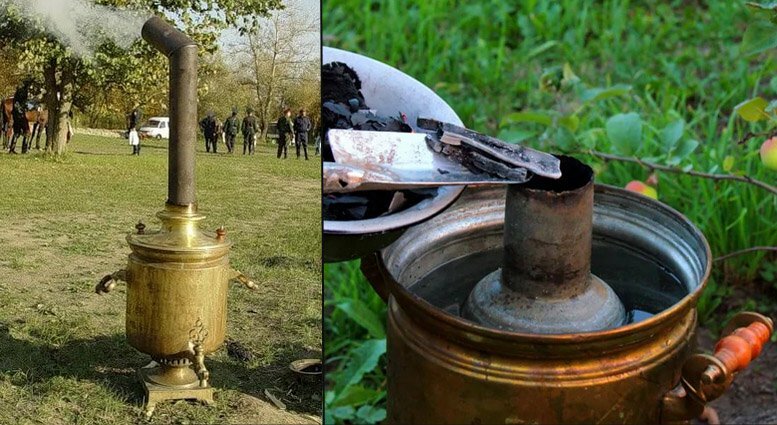 A samovar is a metal vessel with a furnace inside, which is filled with hot coals and heats up water. A samovar is both a home appliance and a piece of art originating in the 19th century. It is still popular and favored at least by collectors of antiques and traditional Russian table fans. The device is very simple: it is a thin-walled vessel with a vertical pipe that goes from the furnace at the bottom and up to the teapot base at the top. The teapot base can hold a teapot and ventilate the samovar, when covered. 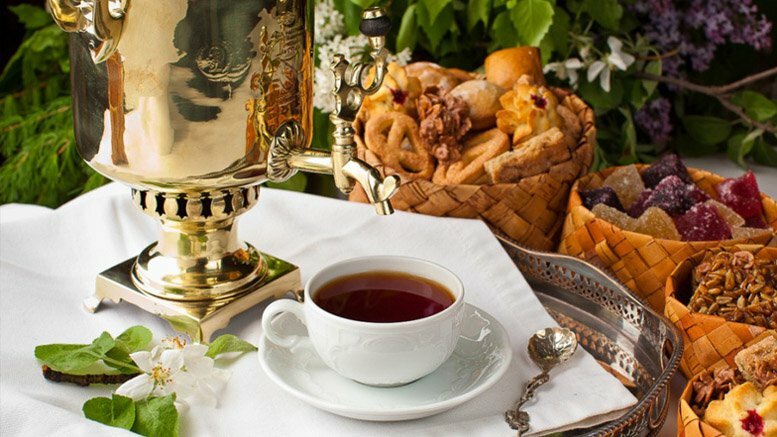 Energy efficiency is one of a samovar’s key characteristics. The pipe guarantees quick boiling and keeps water’s temperature high for a long time. Hot air rising up the pipe creates an excellent draft in the furnace. The furnace is located at the samovar’s bottom, yet safely high above the table’s surface. The pipe is an axial core structure of the entire samovar. It is through the pipe that the appliance is fueled and ignited. You can use twigs, kindling wood and even corns as fuel. Today, there is a broad choice of samovars, including electric ones, which can be used as electric pots. All samovar components (handle, faucet, base, etc.) can be decorated in a variety of patterns. They are located safely away from the heating element, so you will not get burnt. Russian coffee urn differ in volume. The most common old-time samovars are coal-heated and have a volume of 3 to 7 liters. Appliances whose volume is less than 3 liters are usually more expensive, because they are harder to craft and are less common. Electric devices have a volume of 1.5 to 3 liters. Large pieces are rare. Samovars are made of a variety of materials. Brass, copper, melchior and tombac. Copper and silver samovars were used at feasts, and they are the most expensive ones. Today, most samovars are made of copper-covered brass, but it is still possible to find an antique copper samovar. The majority of pieces available for sale are made of gold-plated (they look beautiful, but need proper care) and nickel-plated brass (they have a silver-like shine and look great too, but do not require any special care). Russian coffee urn are filled with water through the top hole, and it is portioned out via the faucet located fairly above the bottom. This prevents fragments of lime buildup from getting into cups. Also, samovars are good for brewing coffee. If you wonder, how to use this Russian coffee urn, do the following: take small canvas packs, fill them with coffee grounds and dip them in water (more advanced models feature mesh coffee filters). Wait until the water boils. Then let the grounds settle. Appliances keep coffee hot for a long time. In the good old days, on rainy days fuel would get soaked. It had to be fanned either via holes in the furnace or by pumping air down the pipe with a high boot. The most exciting examples of modern samovars are made by Company Beem, Germany. Russian coffee urn from this manufacturer feature advanced electric heating and other technologies, such as a concealed heater, overheat and dry boil protection with automatic shutoff systems, thermostats that maintain temperature at individually chosen levels, anti-condensation technologies, anti-limescale and an energy-saving function, which provides an efficient idle mode. Each samovar comes with a tea pot and a tea mesh, and some models have a drip tray.